As has been stated Buddhism has no one all powerful creator god, though Mahayana Buddhists worship bodhisattvas. These are god like figures who have gained enlightenment and could enter Nirvana but chose to stay in the world to help others. There are thousands of them. In Tibet there are also gods. 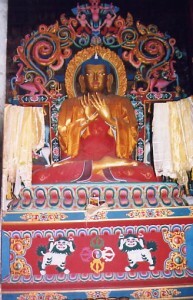 Manjushri is seen as a representation of the Bodhisattva’s. Along with another figure, called Avalokiteshvra, he represents the spirit and strength (or wisdom and compassion) of Buddha. Other figures can represent the same thing, for example the goddess Tara, who is worshipped for her compassion, is said to represent Buddha’s own compassion.